3) The prices below are for Hand-knotted Rug. If you have any special size requirement, please fill the below form regarding any query. 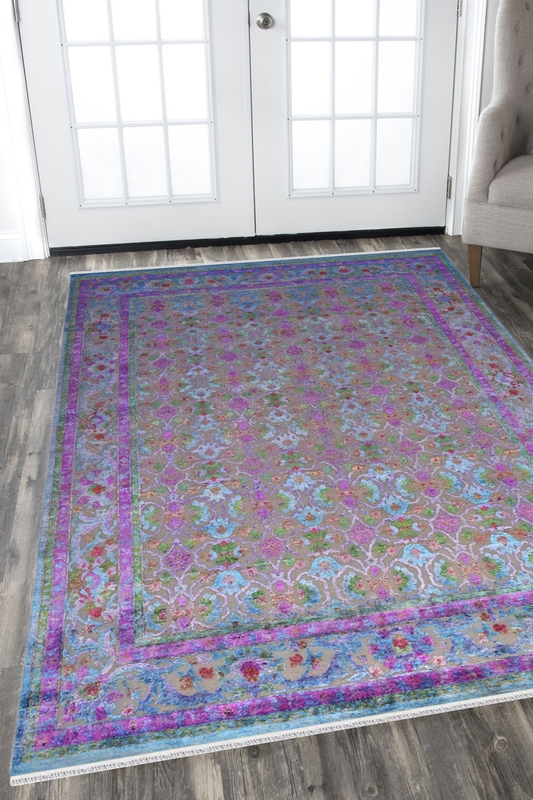 - This beautiful sari silk carpet is handmade in vibrant colors. - It contains the beautiful color combination of beige and turquoise. - For a contemporary look with modern accessories, this oxidize sari silk carpet is skillfully crafted by the talented weavers. - Made from waste of sari silk on cotton. - Warp- Cotton Weft - Sari Silk. Vacuum regularly in the direction of the pile. Avoid direct and continuous exposure to sunlight. Clean liquid spills immediately with a damp cloth or sponge. For hard to remove stains, professional rug cleaning is highly recommended. All of our hand-knotted rugs are professionally washed and are individually inspected before leaving our warehouse. We shall intimate you once your customised rug has been exclusively hand-woven for you and this includes FREE shipping worldwide. There might be a slight variation in color between the actual product and your screen due to difference in computer monitors. We try our best to display the most accurate images. Please be advised that lengths and widths may slightly vary from published dimensions although we strive to provide the most accurate measurements possible.